This is the second article in my series about the Nevada’s 3rd Congressional District race candidates, and focuses on the Republican candidate, Danny Tarkanian. Unlike his opponent, who refused to speak with me, I’ve interviewed Danny on several occasions, both in person and by telephone, to get his answers to some of the questions that are swirling around regarding the race. As the general election race heats up, the political attacks by Susie Lee’s campaign and the liberal PACs are increasing in both speed and intensity. Unfortunately, some irresponsible members of the liberal media continue to repeat these attacks, even with knowledge that some have been successfully refuted in court. It’s more ‘fake news,’ but the media repeats each attack as if they weren’t aware of that. The Lee campaign portrays Danny as being unable to win, pointing to his prior attempts. They fail to point out that, in his past runs for public office, Danny has won five out of six primaries against very tough opponents. And while it is true that he hasn’t won in the general election yet, he’s learned from his experiences and came within just over one percentage point of winning the CD-3 race in 2016 — the closest margin of any race in the country — despite it being a Democrat-majority district in a Democrat year in Nevada. Susie Lee’s supporters are spreading an old falsehood that Danny didn’t pay the property taxes due on a number of investment properties for which he was a part-owner. The truth is that the investment manager did make some payments late. However, the taxes were ultimately PAID IN FULL, along with late fees, by the individual in charge of making those payments for the investment group. All of this is public record, so it’s inexcusable for Susie’s campaign to continue making this accusation and totally irresponsible for some in the media to continue repeating it. And, as we reported last week, Lee and her husband are perennially late paying their taxes and utility bills on the seventeen homes they own. be a fraudulent deal put together by a crooked developer and a dishonest banker whose bank was eventually closed by the FDIC for improper lending practices. At the time, Danny was part-owner of a piece of property in Las Vegas. He and the other investors took out a loan against that property and then loaned the proceeds to the developer for a project in Anza, California. But instead of using the money from Danny’s investment group for the Anza project, the developer used the proceeds to pay off another totally unrelated loan. He defaulted on the Vegas property loan days later and ultimately filed for bankruptcy, leaving the unknowing Tarkanian group of investors holding the bag. Unable to recover the misappropriated funds through legal channels, the Las Vegas property which was used as collateral for the Anza loan was sold in foreclosure and Danny, too, was forced to file for bankruptcy as well as cash in his retirement savings to pay off the debt. To be clear, NONE of the debt released in the bankruptcy was paid by taxpayers. It was paid through insurance which covered the bank that had defrauded the investors. Again, this is all public record which can be easily verified by anyone actually interested in the truth. As a lawyer OVER 20 YEARS AGO, Danny and his law partners helped hundreds of companies navigate the mountains of red tape and bureaucratic paperwork necessary to obtain a business license from the Secretary of State’s office. and filing their paperwork with the government. And that’s not just Danny saying that. After a Democrat state senator first made this same outrageous accusation over a dozen years ago, a jury UNANIMOUSLY sided with Danny in a defamation lawsuit. And Danny is likely to win a similar defamation lawsuit against Rep. Jacky Rosen, who used the same lie in their 2016 race. And yet Lee’s campaign and the Democrat party PACs keep repeating it like a mantra. Danny and the ‘children’s charity.’ The so-called ‘children’s charity’ that Susie Lee and her supporters are referring to is actually the non-profit Tarkanian Basketball Academy, which Danny and his family invested over $2 million of their own money in to build the facility. Danny has managed and operated the academy for over 15 years, drawing an average salary for running the operations of $46,000 per year. This has been approved by the organization’s Board of Directors. Being paid a salary is usual and customary for executives, managers and directors of nonprofits for the services they provide — and Susie Lee knows that. In fact, according to a recent tax filing we found for Communities in Schools of Nevada, the nonprofit Susie is involved with, the CEO was paid $147,949 and members of the Board of Directors drew salaries of over $100,000 per year. And what about that other ‘nonprofit’ (M.A.S.H.) Susie ran a few years ago? She burned thru $2.91 MILLION of OUR tax dollars with that one, finally forcing it to close down and file for bankruptcy. In an effort to save his home during the Great Recession and remain close to his father — “Coach Tark” — while he was recovering from a severe heart attack, Danny borrowed money from a family life insurance policy to help pay down his mortgage. “Any implication that Danny was acting improperly is completely wrong and mischaracterizes the lifelong responsibilities he had for our family,’ she said. ‘Danny had full authority to borrow money from each of our family entities, including the life insurance policies, contrary to what this article states.’” And yet, Susie Lee’s supporters continue to shamelessly peddle this whopper. 1) Are you willing to introduce legislation that would temporarily suspend the gasoline taxes? Answer: Yes. 2) Are you willing to introduce legislation that would outlaw income taxes on tips and gratuities? Answer: Yes, they are gifts and should not be taxed. 3) Would you support President Trump authorizing our military to go after the terrorist drug cartel leaders, the same way we went after Hussein and Bin Laden? This would help save over 80,000 Americans that we lost to drugs and cartel violence each year. Answer: Yes. 4) Would you allow Americans to purchase health insurance across State lines? Answer: Yes, we have to do something about the skyrocketing costs of health care that have been caused by the failed ACA (Obama-care). water is abundant (like the Northwest with the Columbia and Snake rivers) to places where it is sorely needed, like Nevada? Answer: Yes, absolutely. Susie Lee thinks that our water problems in Nevada are caused by ‘climate change.’ I know better. 6) Are you willing to sponsor legislation requiring Congress to pay back all funds that have been ‘borrowed’ (actually stolen) from the Social Security Trust Fund and forbid them from borrowing more? Answer: Yes. So why can’t Danny win? Susie Lee and her liberal friends continue to feed this ‘fake news’ to the media and the public, and Danny refuses to attack her in return. That’s the main reason that Danny won’t win. Is Danny Tarkanian a better candidate than his opponent? Absolutely. And my investigation shows that Danny could actually win this race, if he will get more aggressive in his campaigning and address the lies and ‘Fake News’ that Lee and her supporters keep spewing. But at this point, he’s not campaigning aggressively enough to overcome the barrage from the Democrats. We needed Obama to be the greatest President of our time, as we need every President to be. Now we need Donald Trump to be the greatest President of all time. The obstructionist Democratic leadership is doing everything it can to force his failure. Our Country can’t survive that. 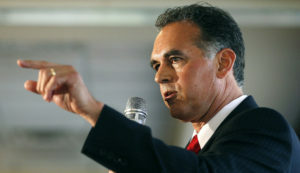 That is why the Las Vegas Tribune puts its support behind Danny Tarkanian for Congress in CD-3. Next story I predict it: Electronic gizmo will replace humans in their job.